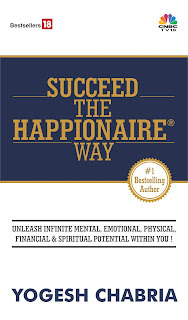 Yogesh Chabria - The Happionaire ​Blog - Best Motivational Speakers In India - Inspiration, Success: Can You Please Share: Life Without Fear? Can You Please Share: Life Without Fear? I was happy to get emails from so many people about the way this story helped them. It made me smile. I want all of you to do something very simple, as soon as you get this, simply forward it to all those who matter to you. Several of you might have already done it, but it is a humble request. Sharing this will make more people smile and live a fuller life. If you don't forward it nothing bad will happen - but if you do forward it a lot of good will happen and we all want good in this world, don't we? One of the biggest assets in business, life and learning is to be bold and have no fear. It is usually fear that stops most people from doing things they truly desire. It is fear that stops us from learning new things, it is fear that stops us from asking questions, it is fear that stops us from experimenting with new ways, it is fear that stops us from making an effort to learn as we are afraid. Once we get rid of fear, life becomes wonderful, once we stop fearing people ridiculing us we end up asking all start of questions, we start feeling free. The biggest asset one can have is to be free from fear - once that happens life truly changes. Every now and then every one of us has some fer or the other, it tries to take control and makes us think of all the negative, in such times it makes sense to simple snap out of it, to be bold and realize that what we truly fear is fear itself. Try living the moment, without fear, get rid of whatever scares you, it is simply in the mind. Once your mind get rids of fear, you will realize there is nothing really you should fear. It is all a learning phase and the more your learn the more you realize how little you know. I tend to speak to almost everyone, many times people ask me - "Yogesh, what if the opposite person don't like you speaking to them?" - "What if they don't respond?" - this is a fear many people have - speaking to others. Out of all the people I have spoken, maybe just a handful have not responded too well, and that too doesn't bother me at all. They might be having some difficulties of their own and the benefits I have got from speaking with people have been immense in terms of learning, in terms of making new friends and helping with business and entrepreneurship. I have been travelling now and learning new things and experiencing a new way of life. I have also been reading some lovely biographies of Henry Ford, Edison and others, I think they make for wonderful inspirations and reading. Keep smiling, keep learning and have faith in yourself.You are indeed wonderful and can do whatever you desire and make up your mind to do!